I’m so excited to announce this year’s Birthday Bash. The prizes are better than ever, and of course, so are the books. If you’ve never seen or heard of the InspyRomance Birthday Bash, no fear. I’ll explain it all after you get to see all the great loot you have a chance to win. US winners are eligible for all bundles except the one marked INTERNATIONAL bundle. 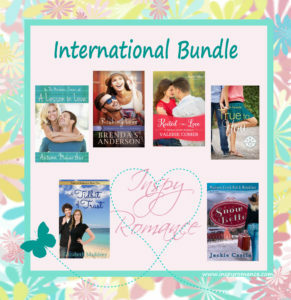 INTERNATIONAL winners must comment stating their country of residence to be eligible for the International Bundle. You MUST comment for a chance to win. Click here to find more blog posts to comment on for more chances to win! 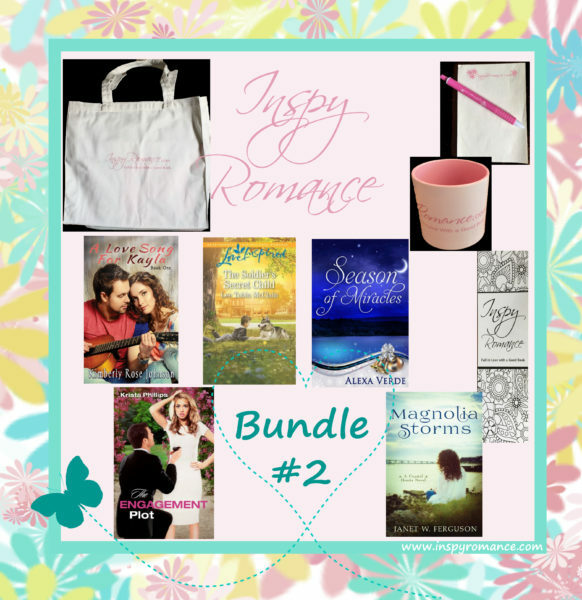 Inspy Romance giveaways are sponsored by Inspy Romance and its authors. Inspy Romance authors, posting guests, and the immediate family of either are not eligible to win. All winners must be 18 years or older. International entrants are eligible for e-prizes and the International Bundle. Prizes sent via physical mail are restricted to U.S. mailing addresses only unless specifically noted. Every comment on an Inspy Romance blog post during that time (with the exception of exclusions listed above) is an entry. No purchase necessary. Void where prohibited by law. Winners will be randomly selected and announced within two weeks of closing at https://www.inspyromance.com. 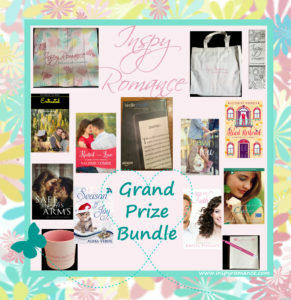 Inspy Romance will contact the winners and post their names in the next Sunday Edition. I’m not real sure what I’m supposed to comment about, so I will try. I often read books from your site, and I enjoy them very much. I’m not aware of romance Birthday bash. Is it Inspy’s Birthday 🎂 or am I to tell you mine? lol 😆Well I just had mine, February 7th. Happy belated birthday, Kathy. We’re so glad to have you with us. It is Inspy Romance’s birthday. And for our birthday, we want to give you gifts. Hi Ginger and HAPPY BIRTHDAY inspyromance:) 4 years- wow! Here’s to the next 4 years! Thanks for thinking of the international readers, pretty awesome prizes for everyone. Your Birthday Bash is better than ever this year. What great bundles you have put together. Thank you for the chance to win a wonderful bundle. I love reading books from all the authors on InSpy Romance. Happy Valentines Day! Happy Valentine’s Day, Pat. Thanks for your support for all of our authors and for Inspy Romance. This is a wonderful chance to read these books. I have read many of these authors before. Thanks, Maryalice, both for stopping by and for supporting our authors. Happy Birthday! What an amazing bunch of birthday bundles you are all planning to give away! I live this blog, and enjoy all the posts! So glad to be a part of the group! And we love our readers. We are glad you’re here too, Paula. Thanks for your support. Hi Ginger! 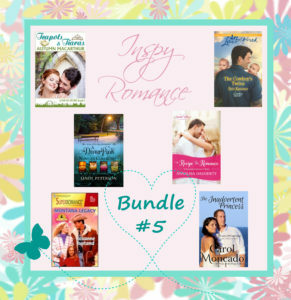 Happy 4th Birthday Inspy Romance! Over the last four years, I have enjoyed following this site, interacting with international authors and readers, and enjoying a variety of well crafted, inspiring romances. Thank you for just great bundles for both US and international readers. This year there are many books that I have not read yet. WOW! Best wishes to the IR administrative staff and all the authors. Looking forward to another 4 years of inspiring blogs and romances. Happy Valentine’s Day to authors and readers! Happy Valentine’s Day, Renate. It has been a great four years, and I also look forward to not only four more years, but many more to come. How exciting! Happy birthday Inspy Romance and here’s to many more birthdays to come! I’m thankful for all of the great new authors I’ve discovered through Inspy Romance. Happy Birthday to Inspy Romance! Thanks for putting together the great prizes! Happy Birthday to you! You have outdone yourselves this year. I thank you for allowing me to discover many new authors this past year. Happy 4tb Birthday!! What a great group of authors and books!! Thank you for the chance of winning these awesome prizes!!!!! Thanks and you’re welcome, Brenda. Happy 4th birthday!! Great bundles! Thanks for the chance to win! Happy 4th Birthday, Inspy! These are amazingly generous giveaways for the birthday bash! Thank you for the chance! Welcome, Lucy. We’re glad you’ve joined us. This is the first time that I have been involved for Inspy Birthday! A very Happy birthday! This is a fun way to celebrate you. Welcome, Becky. We’re glad you’ve joined our little group. Thanks for offering this giveaway. There are so many great books and prizes included! You’re welcome, Jessica. We have some great authors. Thanks for the generous giveaway! Thanks for writing! I always enjoy the inspy romance authors am thankful I found this blog. God bless! Thank you for this fun giveaway. All of the prizes look wonderful. Happy birthday, Inspy Romance! 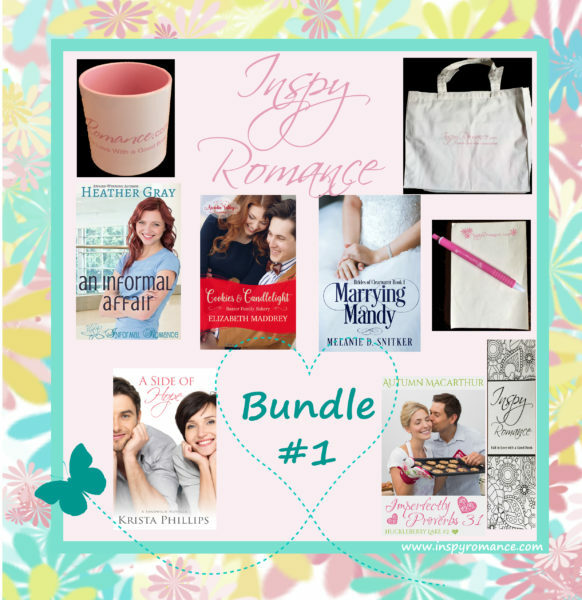 These are wonderful giveaway packages! I have enjoyed reading so many books by these authors, and plan to continue doing so. Thanks, Suzanne. We appreciate your support. Thanks, Geovanna. Happy Valentine’s Day to you as well. InspyRomance Birthday! Happy Day to YOU!! Happy Birthday, Inspy Romance! Thank you for the chance to win one of these wonderful prize packages. Thanks, Susan, and you’re welcome. Woo-hoo! Happy birthday, Inspy Romance!!! Hi Ginger. Looks like an amazing bunch of prize packages this year. Happy Birthday IR! Yes, our authors have been generous. Thanks for the b-day wishes. We’re glad you’re here, too, Tammy. Our first international commenter (who mentioned her country), woohoo!! Happy fourth Birthday to all the fantastic authors here at Inspy Romance! Blessings for a thriving and successful year! I would love to win one of these awesome prize bundles, thanks for the giveaway! Happy Birthday! 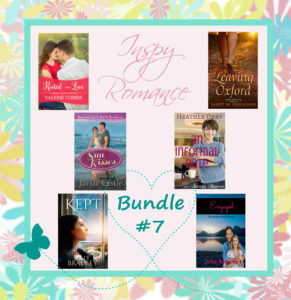 I can’t even remember now how I discovered InspyRomance, but you’ve sure filled up my Kindle :-) The only problem I have with your birthday giveaway bundles is that I already have most of the books!! I have the same issue Margaret. My Kindle is full of e- books! Thanks for including me in your pool for the giveaways. Happy Birthday! The more the merrier, Joyce. I enjoy reading the books and blogs from you and the other authors. Thanks for your support, Mary. Wow, happiest of birthdays to Inspy Romance!!! Keep on bringing us fun and interesting posts – I love to pop in and read them. :) Thank you!! Thanks, Susan. We appreciate your support. Well happy birthday from Canada! Love that you’re including international readers in the giveaways. Very much appreciate keeping up with some of my favourite authors, along with the intros to new ones. Welcome, Jenni. We love our international readers, too. What a great way to spend a birthday! Giving something to others. What a blessing this is to others. Your authors are wonderful. Hi! I’m not sure what to comment about. I’m new to this so will say happy birthday! Welcome, Cathy, and thank you. I’m not sure how long I’ve been on this list, less than a year I believe. Don’t remember you celebrating a birthday before. Happy 4th to you. I like the looks of all of the bundles so whatever will be ok with me. I’m trying to cut back on the ebooks anyway, because my cloud is almost full. I may have to take some pictures off. I like the kind of messages your authors put up. Usually very uplifting. In this troubled world we live in, we need more of that. Welcome, Nancy. Glad you’ve stuck with us and that you enjoy our content. Happy birthday inspy! I’m glad I found you. I enjoy the blog posts and community in general here. It’s nice to have like-minded connections! I’m a Canada dweller. Thank you, Becky. We’re glad you found us, too. Happy Birthday IR. Hard to believe it has been 4 years already. I was with IR since about the beginning if my memory serves me correct. I backed off for awhile with not responding to give others a chance to win giveaways. What a nice selection of gift prizes. Best of luck to everyone. Thank you for doing this for us. Thanks for sticking with us, Nancy. What a big collection of giveaways. Thanks to all ☺ 🎂 to a great group of Christian romance authors. Wow! What a wonderful giveaway! Thanks for stopping by, Cathy. Hi! Happy Birthday! What some wonderful giveaways and books. Thank you for these wonderful bundles of prizes. Happy Valentine’s Day! Thanks, Tracy. Happy Valentine’s Day. Happy 4th birthday, IR! I’m happy I found this place. What a great bunch of prizes to be given away. Thank you for a great blog and great reading! Thanks, Sherri. We’re happy you found us, too. Thanks, Connie. We try to make it big all around, but you’re right; it’s hard to include international winners. We finally figured out a way to do it. Happy Valentine’s Day. What a fun birthday bash! These bundles are fun!! Happy 4th Birthday! I think I’ve been with you great authors about 2 yrs….love it. Thanks for your birthday giveaways! Thanks, Jackie. We’re glad you’ve stuck around. This is so awesome. Thank you for the chance. Happy, happy birthday! Thanks, Judy, and you’re welcome. Hello. Thanks for the wonderful giveaway. Hello. Thanks for stopping by. Such a great opportunity to glean some great reading from some incredible authors! Happy Valentine’s Day to you all!!! That’s the reason we do it, Kelly Jo. We want you pulled and thoroughly pleased while reading our blog and our books. Happy (belated) Valentine’s Day. YOUR Birthday. Congratulations. I am all your readers are wishing you many, many more years! Thanks, Sandra. It might seem complicated, but it’s not. :) It only took me a few hours to put all those pics together. Now writing the books, on the other hand, that takes many hours of work. Now that I’ve become a writer, I realize just how much time a book takes. I have come to appreciate books even more. Happy birthday Inspy Romance!!!!!! Let’s throw confetti, blow our horns, don our party hats and eat cake….lol!! It’s awesome, isn’t it, Your Majesty? Happy 4th birthday! Thanks so much for having such a wonderful celebration and the chance to win some awesome prizes! I hope you get to celebrate many more years to come! Just saw this on Twitter. Haven’t heard of you before but happy birthday!! The bundles all look fantastic! I’d say that’s a great deal–it’s your birthday and you give us presents! It sounds like there are a lot of great gift bundles from some amazing authors. Thanks for sharing your time and talents! Thanks, Winnie. We want to show our love for our readers on our birthday, because without you, well, we wouldn’t make any money. LOL Seriously, our readers make writing a worthwhile pursuit. Happy Birthday, Inspy Romance! Thanks for the giveaway and the chance to win these great prizes. Best wishes on your blog! This is an amazing giveaway! Such wonderful prize packages. I follow most of these authors on facebook and am always adding books to my tbr list. Thanks so much for the chance to win. Thanks for stopping by, Arletta. Yeah, my tbr pile is huge. I love my fellow IR authors. Happy birthday Inspy Romance! Love this blog. Thanks, Angela. And we love our readers. New to this group so I feel like I have already received the gift of a community! Happy Birthday! Welcome, Anitra. We’re glad to have you with us. These are great prizes! Thanks for celebrating your birthday by giving gifts away! Always enjoy the blog. Thanks, Megan. We work hard to make it special for our readers. Happy Birthday!! Such a great giveaway by some authors I have read and liked and some I would like to try out! Thank you for the chance to win! Thanks for your support, Genny. You’re welcome, and thanks for stopping by, Amelia. Happy Birthday! I just celebrated my 5th blogoversary as a book review blogger on my blog, Tell Tale Book Reviews, back in December. It’s so important to celebrate these milestones so I wish you a hearty CONGRATULATIONS! Congrats on your blogiversary, Jasmine. Thanks for stopping by. Happy Birthday! Great to have found your blog. Always look forward to reading your posts. Thanks, Paula. We’re glad you found us, too. Wishing you a Happy Birthday! Congratulations on all the great posts during that time! Here’s to many more! Wow! HAPPY BIRTHDAY!!! 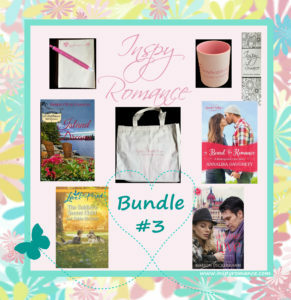 I can’t believe Inspy Romance has been up and running for four years….It seems like just yesterday that the blog began! Thank you for the interesting blog posts and AMAZING book recommendations. Thanks for hanging out with us, Sarah. It does seem like time just flew by. Wowza, you ladies have truly outdone yourselves! Can’t wait to see who wins these awesome prizes! Thanks, Teri. Me, either. I get so excited sending out the prizes to our winners. Happy birthday to y’all! That’s Texas style! Thank you for the great giveaway! Great prizes ! Happy Birthday to all.First I’ve seen this blog.Awesome prizes thanks for the chance. Thanks, Nancy. And welcome to Inspy Romance. We hope you’ll stay a while. I didn’t know about this website at all until I read about the birthday bash in an author’s newsletter. So needless to say, I am very excited about the chance to win one of the bundles but also super excited to read new books from authors I was unfamiliar with before! Thank you for the opportunity! Welcome, Toni. We’re glad you’re here. Thank you Inspy Authors. I won a gift card last drawing & I’m using it to try out some of your authors that I haven’t read. Great way to find new favorite authors. Thank you for the opportunity to participate in your birthday bash celebration. Thanks, Pat. We appreciate your support. Wow! I just found y’all! Super excited!! Happy Birthday Inspy!! Thanks, Kimberly, and welcome to Inspy Romance. We hope you’ll stay a while. Happy Birthday! I’m happy to find your site. Thanks for the chance to win your awesome giveaway. Thank you, Robin. We’re so glad you’ve found us. Thanks so much for this awesome giveaway. I would be so excited to win anything. I love inspy romances! Thanks for stopping by, Debbie. Ooh. Thanks for the great giveaways! Happy Valentine’s Day! Thanks for stopping by, MJSH. Happy (belated) Valentine’s Day. Happy birthday InspyRomance! I love this time of year, don’t you? Between Valentine’s the start of spring, and my own birthday at the end of February, there’s a lot going I ! Thank you, Suzie. I do. Between now and spring we have three birthdays in the house. Happy birthday to you as well. Happy birthday authors!! I love great giveaways and this is one of them. Thanks for the chance!! Happy birthday!!!! Well….it’s belated, I supposed. I’ve so enjoyed following this blog! We’ll take it, MJSH. Thanks. We’re glad you like it here. Happy Birthday, Inspy ❣️❣️❣️ Your continual generosity toward your readers is so appreciated. We are very happy for you all and cheering for your successes! Much love in Christ! Happy birthday. You are so generous. Giveaways look fantastic. Thank you, Jen. I think I would also live in a permanently sleep-deprived state if my favorite authors wrote faster. My husband often turns over and tells me to go to sleep because I’m up reading. Are we supposed to comment on just this blog post, or on individual author posts? It’s not clear to me if there are other posts we’re supposed to comment on. Thanks. They are all wonderful prizes and whoever wins them will receive wonderful gifts. Thank you for the opportunity to try to win one of them. lol, I know all to well as you know. For us it’s enjoy the cold, summer will probably be a unbearable. You are a very sweet person. I hope to get to know you better through this. I enjoy talking with you authors. For know 😴 I’m fading. Happy Birthday Inspy. I enjoy reading and excited to be able to read some of the authors I am not as familiar with. Look forward to reading some of these books. Thanks for stopping by, Sabrina. I agree about the great prizes. Happy Anniversary! What a fun and generous giveaway! Happy Birthday InspyRomance! Thank you for sharing all things about our beloved Authors! This is a great place to hang out after a stressful day at work. And thanks for the chance at the giveaways. So kind of you! Enjoy your day! God Bless. Thanks, Sharon. We’re glad you can relax with us at the end of your day. Thanks, Josephine-Anne, and happy birthday. Such incredible prizes, fingers crossed I win. Happy Birthday and make it a good one. Thanks for stopping by, Catherine. I live in Israel and it’s typical for those having a birthday to bring the cake and other sweet things. You are doing the same thing by offering gifts for your birthday! What a generous and wonderful idea. I appreciate the books I’ve read and enjoy reading – I look forward to the time I have to read. Happy Birthday to Inspy Romance and all of you who participate. Thanks for stopping by, Jeannie. Happy 4th Birthday and many more! Happy Birthday to you! Congrats. Mine was January 20. Thanks so much for your generosity. Thanks, Debra. Happy belated birthday. Thanks for stopping by, Kim. Happy Birthday Inspy. I have found many great authors and books through this blog. Thanks! Thanks, Heather. We appreciate your support. Happy Birthday Bash! Thank you for the giveaway opportunity of lovely prizes. Welcome, Heather. We’re glad you found us. Check out the giveaways page for more information. Thanks for stopping by, Sarah. Happy birthday. Thanks for stopping by, Teresa. Happy Birthday to Inspy Romance! Thank you for the chance of winning some great reading bundles. Happy 4th Birthday! Heres to many more great years! Thanks for all the amazing prize pack chances its so generous of you to do them! Happy Birthday! Wishing you many more amazing years! Thanks for stopping by, Maria. Happy Birthday Inspy Romance! Thank you for the opportunity to win some great prizes. Love the books! Thanks, Betty. There are some great books listed. Happy birthday, Inspy Romance! These look like some fun bundles! Wow this is amazing!! Happy Birthday a little late and just love these authors! Thank you! Thanks, Lori. And you’re welcome. Happy Birthday Inspy Romance! What a fun giveaway, thank you! Wishing you the happiest of birthdays! You have gone above and beyond with the fantastic giveaways! Thanks so much for the chance to win! It’s hard to imagine it’s been 4 years! Congrats! It doesn’t seem quite that long, does it, Kate? Thanks for stopping by. Happy Birthday! I don’t get over here as often as I used to. I can’t believe I’ve missed this! 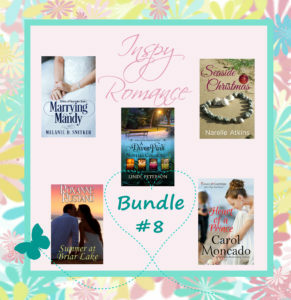 I so enjoy many of the Inspy Romance books! :) And, what great prize packages! Y’all are awesome! Thanks for your support, Kelly. Wow! These are some great prizes. Happy Birthday and thanks for the opportunity to win. Thanks for stopping by, Liberty. Glad to discover this blog. Thank you for the chance to participate. Welcome, Cathy. We’re glad you found us. You’re welcome, Amanda. Thanks for stopping by. Happy birthday. I love book giveaways. Awesome prizes. Thanks for stopping by, Stacie. Thanks, Maria. Happy belated birthday to your daughter. Happy Birthday. Hope someone treats you special as my Aunt Marry did for me when I was younger. She always made me a birthday cake that delicious and so pretty. It was the highlight of my day when she came with the cake and I looked forward to it greatly. Thanks, Vera. That’s a special memory. Happy birthday! I’m looking forward to the chance to win one of the bundles. Thank you! Thanks for stopping by, Alison. This is a new website to me! I would love to win a bundle!March is my birthday month. Thanks for stopping by, Martha. We’re glad you found us. Happy birthday. Would Love to win any of these Fabulous Birthday Bash giveaways!! p.s. Why is the comment always at bottom of page? Thanks for stopping by, Bonnie. If you mean the comment button, there is one at the top. Happy Birthday!!! What a great way to celebrate. Since there are a lot of January birthdays in my family we try to go out to eat during the month. Thanks for stopping by, Robin. Wonderful prize packs! Hope you notify the winners and best wishes to them! We will definitely let you know if you win. The winners will also be announced in our Sunday Edition following the end of the giveaway. Thanks for stopping by, Vivian. I live in PA in the good old USA. Thanks for the wonderful contest with great authors. This bash contains a wonderful group of authors, I will be searching Amazon fast and furiously. Happy Birthday, this Bash has some absolutely fabulous prizes! Would be fantastic to win!! !